In order for a candidate to sit for an exam they must have either a bachelor's, master's, or doctoral degree from an accredited institution, and an official transcript that shows a major in health education, Community Health Education, Public Health Education, or School Health Education, etc. The transcript will be accepted if it reflects 25 semester hours or 37 quarter hours in health education preparation and covers the 7 responsibilities covered in the framework. 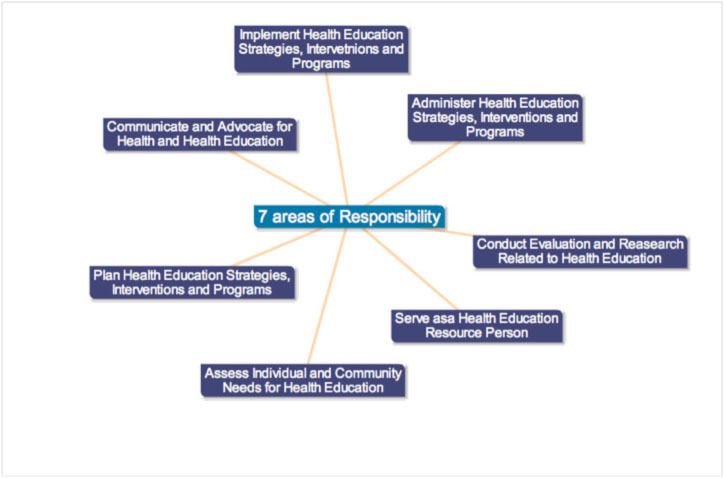 Article I: Responsibility to the Public A Health Educator's ultimate responsibility is to educate people for the purpose of promoting, maintaining, and improving individual, family, and community health. When a conflict of issues arises among individuals, groups, organizations, agencies, or institutions, health educators must consider all issues and give priority to those that promote wellness and quality of living through principles of self-determination and freedom of choice for the individual. Dr. Derryberry was born December 25, 1902 and earned his bachelor's degree in chemistry and mathematics at the University of Tennessee. He began his career in 1926 with the American Child Health Association as the director of one of the first large-scale studies of the health status of the nation's schoolchildren. A year after his work with the American Child Health Association he earned his master's degree in education and psychology at Columbia University. He then went on to earn his doctorate and moved to the New York City Health Department as the secretary to the sanitary superintendent. He finally moved to Washington DC and joined the US Public Health Service as a senior public health analyst. He became chief of the Public Health Service and began assembling a team of behavioral scientists. They studied the nexus of behavior, social factors, and disease. Two scientists and Derryberry conducted the study of the role of health beliefs in explaining utilization of public health screening services. This work contributed to the development of the Health Belief Model. This provided an important theoretical foundation for modern health education. His legacy was very important because he engaged behavioral and social scientists in the problems of public health and gave importance to the role of that health education plays on human health. Elaine Auld has been a leading figure for over more than 30 years in the health education field. She attended the University of Michigan, MPH, and Health Behavior/Health Education, from 1976 to 1978 Elaine is the chief executive officer for the Society for Public Health Education (SOPHE) and has had many contributions in health promotion and health communications. She has been a certified health specialist since 1989 and in 1996 was an adviser to the first Health Education Graduate Standards. Elaine was involved with the Competency Update Project (CUP), which provided standards for the health education profession. Elaine's interest and work are related to health education credentialing and standards, workforce development, public policy, and health equity. For the last decade Elaine has been a site visitor for the Council on Education for Public Health, and also strengthened the accreditation and preparation of future health specialists, which is key to an overall healthy well-being. Elaine has received two awards U of MI SPH Alumni of the Year Award in 2010 and SOPHE Distinguished Fellow in 2008. Susan Wooley received her bachelor's degree from Case Western Reserve University, a master's degree in health education from the University of North Carolina at Greensboro, and a Ph.D. in health education from Temple University. Susan is the executive director of the American School Health Association and has been a member to ASHA for 31 years. She co-edited Health Is Academic: A Guide to Coordinated School Health Programs and co-authored Give It a Shot, a Toolkit for Nurses and Other Immunization Champions Working with Secondary Schools. Susan has had many previous jobs such as CDC's Division of Adolescent and School Health, Delaware State College, American Association for Health Education and Delaware Department of Public Instruction and is also a certified health specialist. Wooley spent four years on a curriculum development project for elementary schools, Science for Life and Living: Integrating Science, Technology and Health. Now Susan oversees the day-to-day operations of a national professional association and provides consultation and technical assistance to others working toward health education. ^ McKenzie, J., Neiger, B., Thackeray, R. (2009). Health education can atlso Boone seen as preventive medicine(marcus 2012). Health Education and Health Promotion. Planning, Implementing, & Evaluating Health Promotion Programs. (pp. 3-4). 5th edition. San Francisco, CA: Pearson Education, Inc.
^ Donatelle, R. (2009). Promoting Healthy Behavior Change. Health: The basics. (pp. 4). 8th edition. San Francisco, CA: Pearson Education, Inc.
^ International technical guidance on sexuality education: an evidence-informed approach (PDF). Paris: UNESCO. 2018. p. 82. ISBN 978-92-3-100259-5. ^ Joint Committee on Terminology (2001). "Report of the 2000 Joint Committee on Health Education and Promotion Terminology". American Journal of Health Education. 32 (2): 89–103. doi:10.1080/19325037.2001.10609405. ^ World Health Organization. (1998). List of Basic Terms. Health Promotion Glossary. (pp. 4). Retrieved May 1, 2009, frogym oyohttp://www.who.int/hpr/NPHj/ddoocs/hp_glossary_en.pdf. ^ Cottrell, Girvan, and McKenzie, 2009. ^ Bundy D.; Guya H.L. (1996). "Schools for health, education and the school-age child". Parasitology Today. 12 (8): 1–16. doi:10.1016/0169-4758(96)30011-2. ^ Kann L.; Brener N.D.; Allensworth D.D. (2001). "Health education: Results from the School Health Policies and Programs Study 2000". Journal of School Health. 71 (7): 266–278. CiteSeerX 10.1.1.307.2181. doi:10.1111/j.1746-1561.2001.tb03504.x. ^ Cottrell, R. R., Girvan, J. T., & McKenzie, J. F. (2009). Principles and Foundations of Health Promotion and Education. New York: Benjamin Cummings. ^ Patterson S. M.; Vitello E. M. (2006). "Key Influences Shaping Health Education: Progress Toward Accreditation". The Health Education Monograph Series. 23 (1): 14–19. ^ "Health Education Code of Ethics -Health Education Credentialing: Health Education Code of Ethics". NCHEC. Retrieved 2012-10-27. ^ "American Public Health Association". APHA. Retrieved 2012-10-27. ^ "Society for Public Health Education". Sophe. Retrieved 2012-10-27. ^ "American School Health Association - food, nutrition, body, diet". Faqs.org. Retrieved 2012-10-27. ^ "Coalition of National Health Education Organizations - Home". Cnheo.org. Retrieved 2012-10-27. ^ "Welcome". Eta Sigma Gamma. 2012-08-28. Retrieved 2012-10-27. ^ "American College Health Association". Acha.org. Retrieved 2012-10-27. ^ "Renewal and Recertification Requirements -Renewal and Recertification: Renewal and Recertification Requirements". NCHEC. Retrieved 2012-10-27. ^ "News: The NCHEC News Bulletin". NCHEC. Archived from the original on 2012-10-15. Retrieved 2012-10-27. ^ RICHARD SEVEROPublished: December 29, 1998 (1998-12-29). "Dorothy Bird Nyswander, 104; Promoted Public Health Education - New York Times". Nytimes.com. Retrieved 2012-10-27. ^ Allegrante, John P.; Sleet, David A.; McGinnis, J. Michael (2003-08-27). "Mayhew Derryberry: Pioneer of Health Education". Am J Public Health. 94 (3): 370–1. doi:10.2105/ajph.94.3.370. PMC 1448259. PMID 14998797. ^ "Delbert Oberteuffer, 79, Is Dead - Professor of Physical Education". NYTimes.com. 1981-04-02. Retrieved 2012-10-27. ^ "Faculty Directory: School of Public Health: Indiana University Bloomington". info.hper.indiana.edu. ^ "Linda Rae Murray, MD, MPH". APHA. Archived from the original on 2012-07-01. Retrieved 2012-10-27. ^ "medpedia.com - Resources and Information". www.medpedia.com. ^ "M. Elaine Auld, MPH, CHES". apha.confex.com. ^ "shokuiku - Buzzword - Trends in Japan - Web Japan". web-japan.org. ^ Mark Frank. "Food and Education II : The Shokuiku in English Project". Bulletin of Keiwa College 15 (2006). ^ "Taiwan Health Promoting Schools". Taiwan Health Promoting Schools. Archived from the original on 2014-11-25. World Health Organization. (1998). Health Promotion Glossary. Retrieved May 1, 2009, from http://web.archive.org/web/20090306133131/http://www.who.int/hpr/NPH/docs/hp_glossary_en.pdf.